So, we have been having LOST of fun with our DIY Fidget Spinners without bearings. 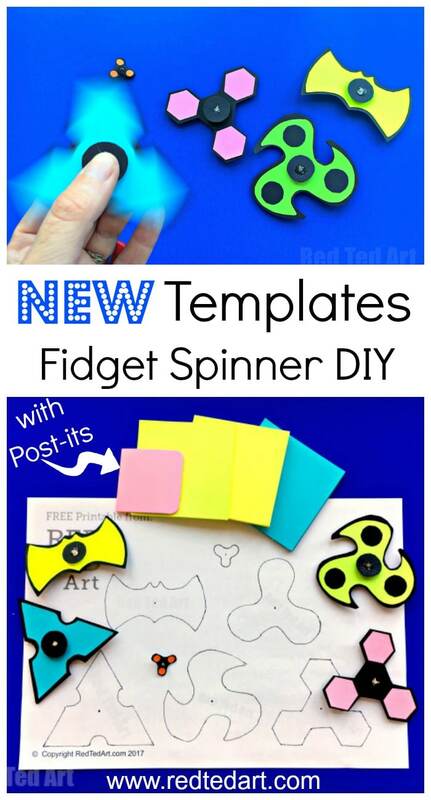 Many of you have messaged me to show me your Fidget Spinner DIYs and how much you are enjoying the DIY Printable Fidget Spinner Template for either use at home or with schools, summer groups, library crafts etc. 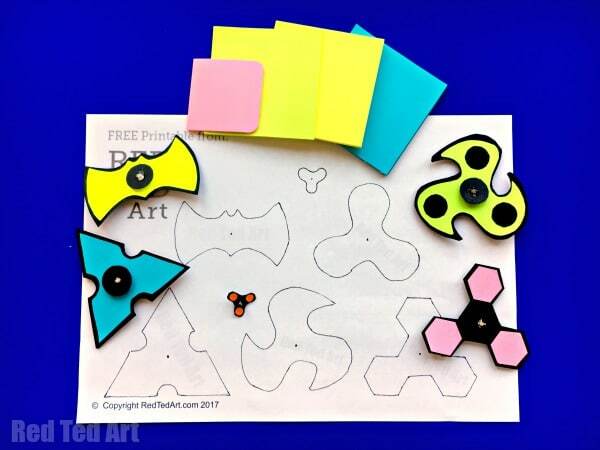 I thought you may therefore enjoy a NEW set of Fidget Spinner Template PDF.. just to keep your creative juices flowing even more… What I love about today’s fidget spinner DIY without bearings, is the BRIGHT colours that I added to them by using Post-it Notes. 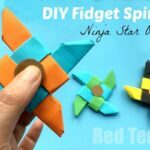 It makes for a fab Post-it Note Fidget Spinner, but of course you still need some glue and toothpicks too (you may by the way, LOVE this Ninja Star Paper Fidget Spinner DIY too.. I bet you could use Post-it Notes for that too and there are NO TEMPLATES needed). 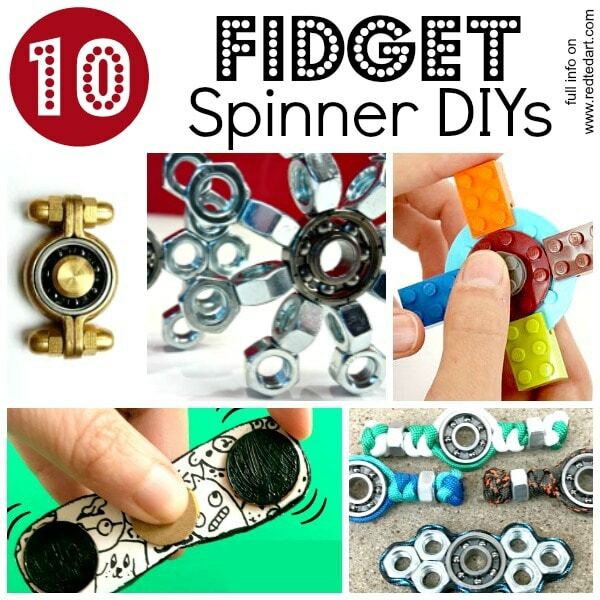 All our “Red Ted Art Fidget Spinner DIY” designs are without bearings.. but should have access to some ball bearings, we put together a fabulous little round up of DIY Fidget Spinners, that includes our paper spinners, but also some LEGO Fidget Spinners and fun Ball Bearing Fidget Spinners! For our MINI Fidget Spinner, we cut down a Paper Clip, but the rest of the assembly is the same. 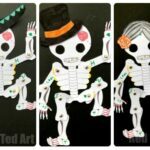 Now I want to give some of my YouTube buddies a mention and if you are looking for yet MORE Printables Fidget Spinner Templates, you may enjoy the Draw So Cute Fidget Spinner Templates too. 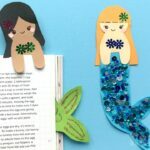 Draw So Cute is a wonderfully talented YouTube channel that teaches you to, well, how to draw. 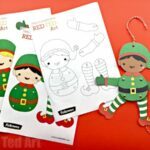 As the Fidget Spinner craze hit the internet, she also created some gorgeous Emoji Fidget Spinner Draw So Cute templates, that I think you will love too. Check her out over on YouTube! Now you REALLY must watch the video, as it is GORGEOUS to see the different Fidget Spinner Patterns in action. 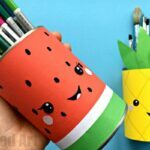 Each design, creates a fantastic new and stuffing spinning effect. 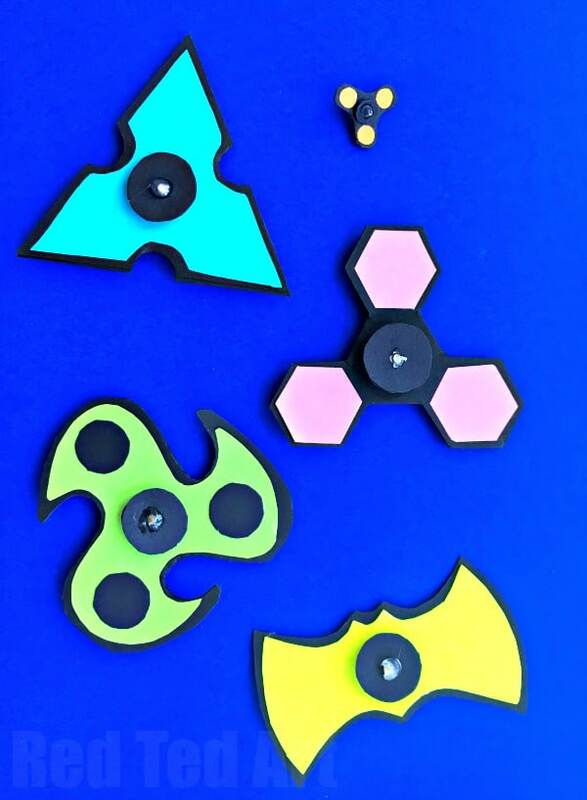 I just LOVE LOVE LOVE how wonderful the Fidget Spinners design looks. 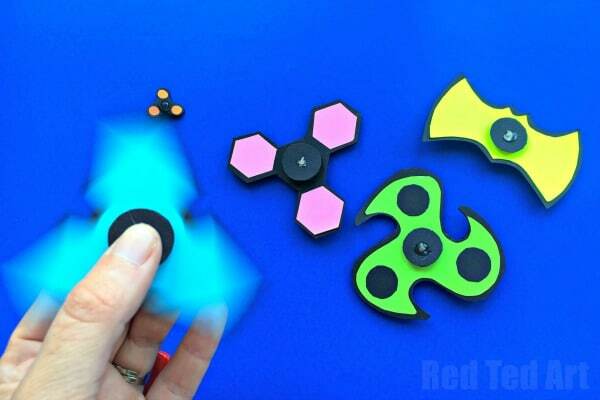 Now the MINI Fidget Spinner was created for fun and as a challenge by fellow YouTube and blogger Natasha Lee, who created an AMAZING set of Mini Nail Fidget Spinners. Yes that is right NAIL Fidget Spinners. When you thought you saw it all.. Natasha comes along. And she also has a hilarious “Nail Fidget Spinner Unicorn horn” too. Hahaha. You have to see it! Ok now.. without further a do.. watch our how to make fidget spinner without bearings video and see how quick and easy it is to use your new fidget spinner template! And I simply can’t resist a few more Post-it Notes Fidget Spinner images!! You can of course decorate your fidget spinners in any way you wish. But love how quick and easy the Post-it Note Fidget Spinners are and how fabulously “poppy” they look. ADORE.. and one more..
Teehee. Hope you love our new DIY Printable fidget spinner template pdf as much as we do! 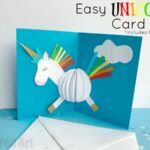 This will make a great Cub Scout activity! Thanks so much for the information. Informative article. Enjoyed enough to reading it. Thank you! 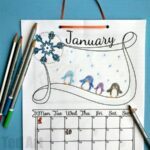 I will use this with my homeschool kids crafts group! What does back of spinner look like? Are the pennies exposed or coveted? It doesn’t matter.. you can stick the pennies between the two sheets of cardboard if you don’t want to see. Watch the video, I am pretty certain I show both sides! Hey Maggy, was wondering if you didn’t want to use coins what was the alternative?! 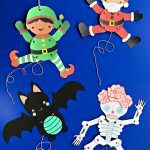 I need to make these for about 50 kids so wanted another option! Anything you can find that has a little weight on it. Maybe beer bottle tops?